How’s it going? Is your knitting on schedule, or spiralling out of control? I hope it’s going well, mine’s somewhere between the two. The cardigan is unlikely to be finished in time, but I’m trying not to obsess over it. I’ll keep going and see how far I get, but I’ll be able to do it over the holidays, even if it’s not ready for Christmas Day itself. For the rest of the family, I’m pretty much there – everyone should have something woolly. I still need to finish a pair of aran socks in time for Boxing Day, and if I can I’d like to squeeze in a pair or two of simple mitts, but we’ll see how I get on. If you’re still in need of knitting ideas for the next couple of days, here’s one that’s super speedy – the Yarn Harlot’s Foot Ovens. 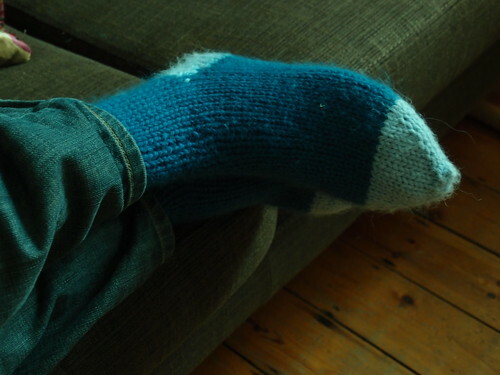 I made these last year and they are very quick and simple, though it helps if you’ve made socks of some description before, as it’s really a recipe more than a detailed pattern. The Misti Alpaca is one of the most delicious things I have ever knitted and makes some very cosy footwear. 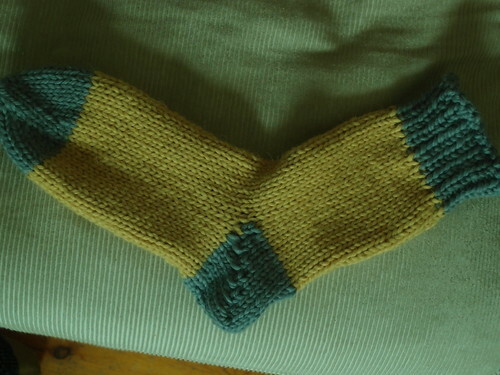 This entry was posted in Knitting and tagged Advent 2012, Christmas knitting, socks. Bookmark the permalink. Ooh lovely. I might have to just switch hubby’s socks to thick ones like these and call them “boot socks”. He wanted to make sure that you knew that he enjoyed your Christmas panto. He lived in England for a bit as a child and joyed the traditional English panto during the holidays. To hear a spoof on them brought back good memories.